At Acorn Mortgages the privacy and data protection rights of our customers is very important to us. Data Protection is the safeguarding of the privacy rights of individuals in relation to the processing of personal data, in both paper and electronic format. The Data Protection Acts 1988 and 2003 (the "Data Protection Acts") lay down strict rules about the way in which personal data and sensitive personal data are collected, accessed, used and disclosed. The Data Protection Acts also permit individuals to access their personal data on request, and confer on individuals the right to have their personal data amended if found to be incorrect. This document outlines the Acorn Mortgages policy to help ensure that we comply with the Data Protection Acts. We shall keep personal data for purposes that are specific, lawful and clearly stated. Personal data will only be processed in a manner compatible with these purposes. We adopt procedures that ensure high levels of data accuracy, completeness and that personal data is up-to-date. Overall responsibility for ensuring compliance with Data Protection Acts rests with Acorn Mortgages. However our responsibility varies depending upon whether we are acting as either a Data Controller or a Data Processor. All employees, agents and contractors of Acorn Mortgages who separately collect, control or process the content and use of personal data are individually responsible for compliance with the Data Protection Acts. The Data Protection Officer co-ordinates the provision of support, assistance, advice and training throughout Acorn Mortgages to ensure that Acorn Mortgages, its agents and contractors are in a position to comply with the legislation. Acorn Mortgages is firmly committed to ensuring personal privacy and compliance with the Data Protection Acts, including the provision of best practice guidelines and procedures in relation to all aspects of Data Protection. This Data Protection Policy is supplemented (and may be amended) by specific policies and procedures adopted by Acorn Mortgages. Please refer to our Privacy Statement, “Right of Access” section for procedures and guidelines on accessing your personal data. Access to this website and use of the information on it is subject to the terms and conditions outlined in our legal notice. By proceeding further you will be deemed to have understood and agreed to be bound by these terms and conditions. If this is not acceptable by you, please exit this site now. 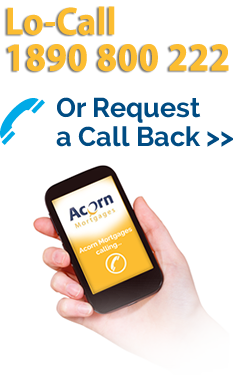 Acorn Brokerage Limited, trading as Acorn Mortgages, is regulated by the Central Bank of Ireland. Acorn Brokerage Limited is registered in Ireland. Registered Number: 513124. Registered Office: St. Augustine Street, Galway. Phone: 091-894426. Email: info@acornmortgages.ie. Acorn Brokerage Limited, trading as Acorn Mortgages, is regulated by the Central Bank of Ireland. In the interest of customer service we will record and monitor calls.